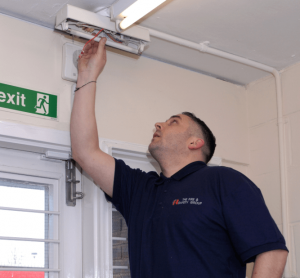 Our fire industry-approved electricians have been installing emergency lighting in all sorts of commercial properties for 20 years, across London, Surrey and the South-East. Emergency lighting installation is required in buildings for the purpose of providing light if normal lighting fails during a fire. If your commercial premises are small, or have a lot of light coming in from outside, you may not need to install emergency lighting in your building. However if your premises are more complex, then you will almost certainly need to think about getting emergency lighting installed to meet regulations. Because emergency lighting is a complex area, we only use fire industry-approved electricians to install emergency or escape lighting across London, Surrey and the South-East. Our emergency lighting engineers are trained in all of the relevant British Standards so you can feel confident that you’re left fire-safety compliant. 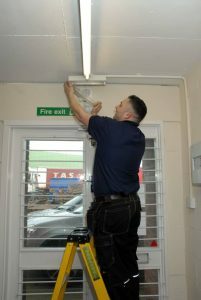 But just to give you that extra peace of mind, we also guarantee all emergency lighting installations for 12 months. Most new buildings now have emergency lighting installed during construction with the design and type of lighting usually specified by the architect to meet Building Regulations and Local Authority requirements. But what if you take on older premises, or reconfigure a building so that it better meets your needs? In these circumstances there is a risk that you may not comply with emergency lighting regulations. The best way to make sure your emergency lighting is compliant is to arrange a visit with a Fire Risk Assessor and an industry-approved emergency lighting electrician. They will be able to assess if your emergency lighting installation meets regulatory standards and, if not, advise the best course of action. We can arrange this kind of survey for you at no cost and with no obligation. Where do I need emergency lighting? There are 2 categories of emergency lighting – ’emergency escape lighting’ and ‘standby lighting’. In this instance we are talking about emergency escape lighting (standby lighting is not a legal requirement and it’s up to the individual business if it has it at all). Open Areas: ‘open area lighting’ is also sometimes called ‘Panic Lighting’ and is designed to make sure that no communal areas are plunged into complete darkness, which could create panic. It also helps occupants find their way to the start of an exit route. High Risk Task Areas: ‘high risk task area lighting’ provides emergency lighting for people located in areas where they are involved in potentially dangerous processes, so they can ‘shut down’ safely. Emergency lighting installation generally requires a degree of cabling. We know the last thing your business needs is disruption and will do everything possible to keep the impact on your day to day activities to a minimum. That might mean making sure we fit in with other contractors working on your site, such as builders for example. Or it might mean scheduling the work out of hours or during a quiet period for your business. Whatever the circumstances, the emergency lighting installation process will start with an industry approved electrician or fire risk assessor visiting you to survey your premises and discuss your specific requirements. There’s no obligation and no fee. It couldn’t be more simple! If you think you need to talk to someone about emergency lighting installation, then please get in touch today.